Oftentimes as we are working on a custom metal modern or contemporary staircase, clients ask if we are able to fabricate a custom railing to match. 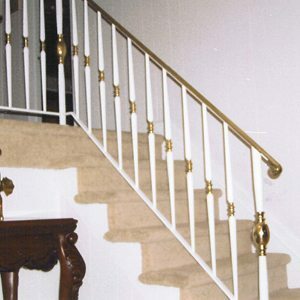 The answer is always yes, as we are happy to fabricate the items needed to complete your desired staircase look! We fabricate and sell a variety of different items to compliment our custom metal stairs, and railing are by far the most popular. 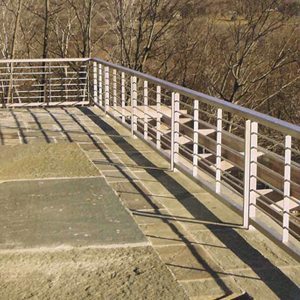 From modern and contemporary steel railings with custom fabricated panels to cable railing systems, your railing options are almost endless. 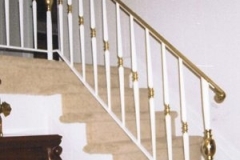 Traditional wrought iron railings and decorative wrought iron banisters are also popular. 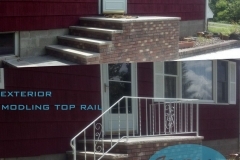 Below is a sampling of some of our other railing work. 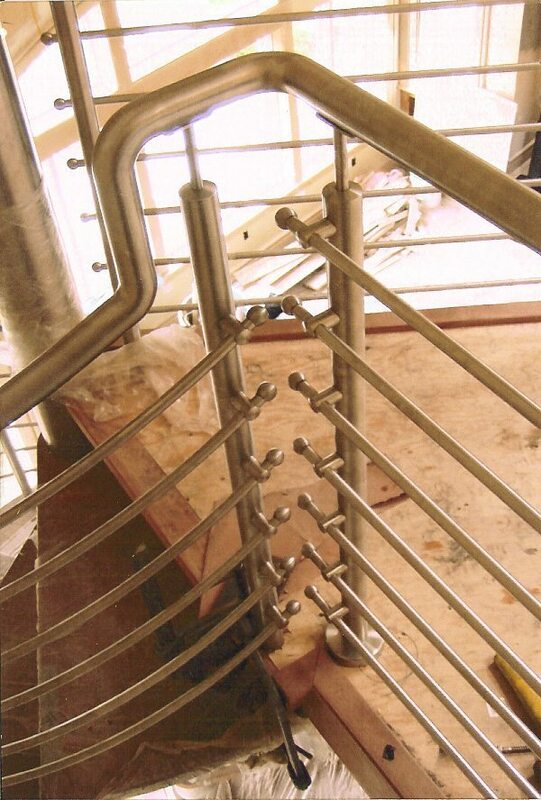 We love making railings for both our stairs and existing staircases. If you don’t see the style you are looking for here, just e-mail us your inspiration picture or sketch and we will be happy to consult with you on design and pricing. This is a very basic railing style. 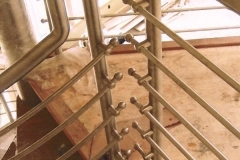 The pipe railing is welded to the posts on the angle of the stair. The posts can be round or square. The posts can be mounted by core-drilling into the concrete or we can use floor mounting feet for lags. 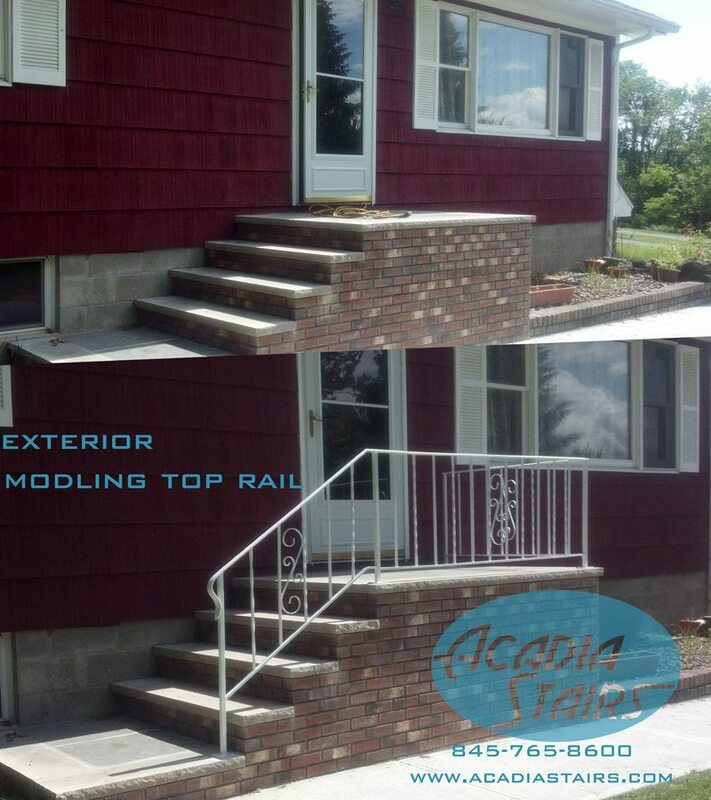 This shows a 2 line railing system. The top line is the hand rail itself. The lower line can be made at any height from just a fraction of an inch above the nose of the treads, to within a few inches of the hand rail (grab rail). Note the safety level-offs at both top and bottom are a recommended feature. 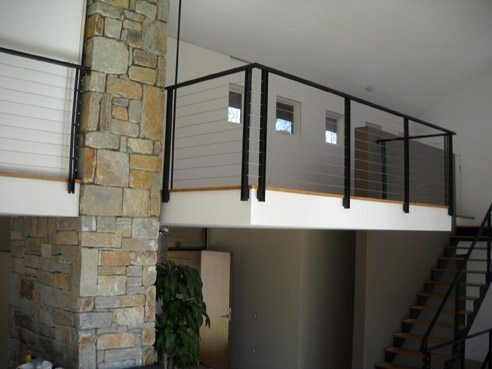 The 3 Line railing can have a much more aesthetic appeal and may be a requirement for some industrial applications. 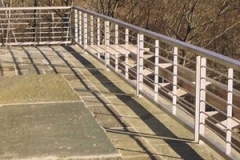 The 3 line rail ensures that the spacing is reduced for more safety, but it also adds rigidity to the railing system. The middle line can align with the level-offs for a cleaner look. The lower lines can be smaller dimension material than the top rail. The panel railing system is a variation of a 2 line railing system. 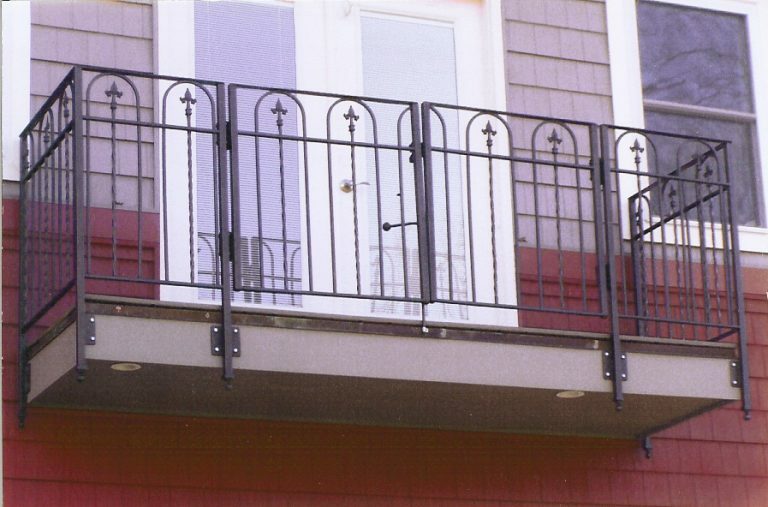 We can fabricate the railings with the clips welded in place, or you can apply your own hardware if you have special details for your panels. This system can be used with glass panels, metal panels or even canvas. 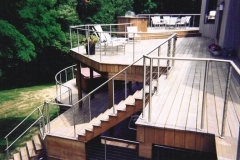 The horizontal line railing or sloping line rail pictured above shows a round top handrail with vertical bar lower lines. We recommend that the spacing between the lines be reduced to less than 4″. A wide variety of materials can be used for the lower lines from rounds, flats and squares and more. Commercial codes may require a railing system to have vertical balusters with less than 4″ spacing, a guard rail at 42″ high and a handrail at 34″ to 36″ high. 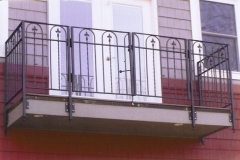 These codes often also require the railing have a level-portion of 12″ at the top and bottom of the stair for entry and exit.